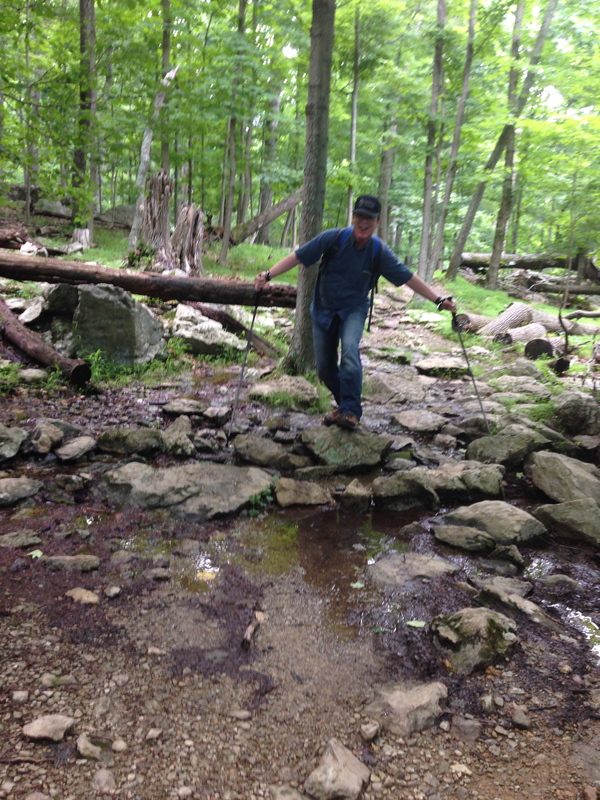 On June 14 Tod and I decided to hike Catoctin Mountain Park again, this time doing a full loop of the trail. 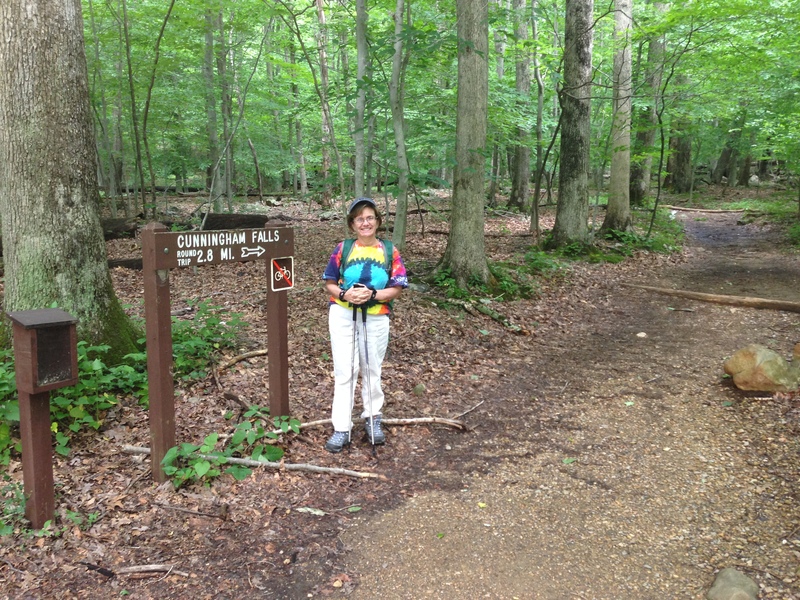 We started at the Visitor Center and took the 1.4 mile Falls Nature Trail to the falls. Just a few weeks earlier this seemed like quite a hike. This time, however, I was really surprised by how quickly we made it to the Cunningham Falls. The Falls were thundering this time, thanks to several days of wet weather that preceded our visit. Lots of families were there, ignoring the signs that asked visitors to stay out of the falls. From there we went up Hog Rock Nature Trail. Tod and I have new trekking poles and we were able to test them out as we climbed up the mountain to what was probably our highest point, at 1610 feet. Again, I really noticed how much easier it is for me to hike. Hardly the huffing and puffing that happened last time! Hog’s Rock was quiet, and we were able to sit on a rock and enjoy the view while we munched on a PB&J and some trail mix. Its not a very impressive spot, but its a nice place to break after the steep hike. Tod goofing around with his new trekking poles. Onward we went, crossing over the Park Central Road and resuming the trail that took us past Thurmont Vista, Wolf Rock, and Chimney Rock. Each one of these spots were destination points for families, and so it was more crowded than the trails themselves. One challenge this time was that many sections of the trails were like streams, with running water and areas that were muddy and messy. We made the mistake of taking the “short cut” to the Catoctin Mountain Park Headquarters. This section, just past Chimney Rock, was a drop of almost 600 feet in less than a mile. Yikes! Much of the trail was just like a river! The last mile of the hike was going from the Catoctin Mountain Headquarters back to the Visitor’s Center. It is listed as a trail on the map but it was the least well-marked section of the trail. It was hard to follow and very rocky. We considered just walking along the road but we didn’t want to wimp out. In retrospect, the road looks like a better option. Overall, the hike was about 9 miles and took about 5 hours. 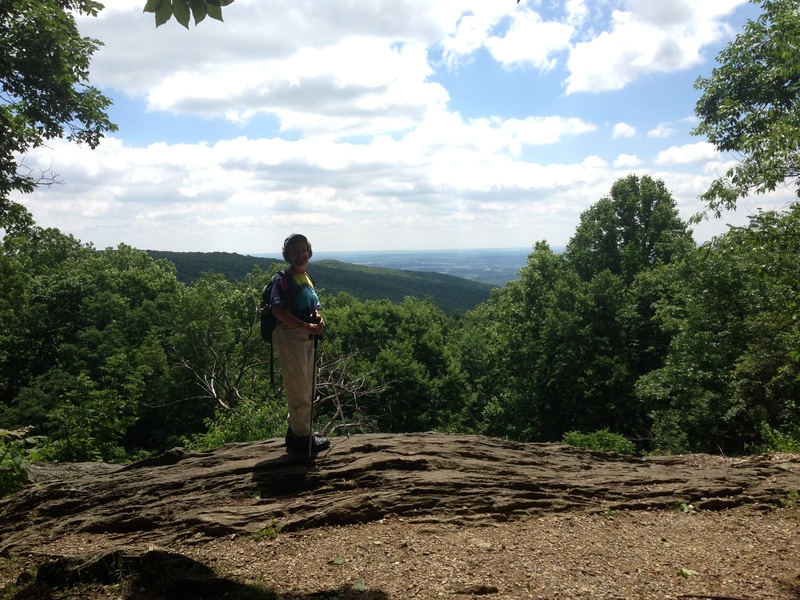 Coming back to Catoctin gave both of us the opportunity to measure our progress as hikers. We can attest to the fact that the more we hike, the better in shape we become. This is encouraging! 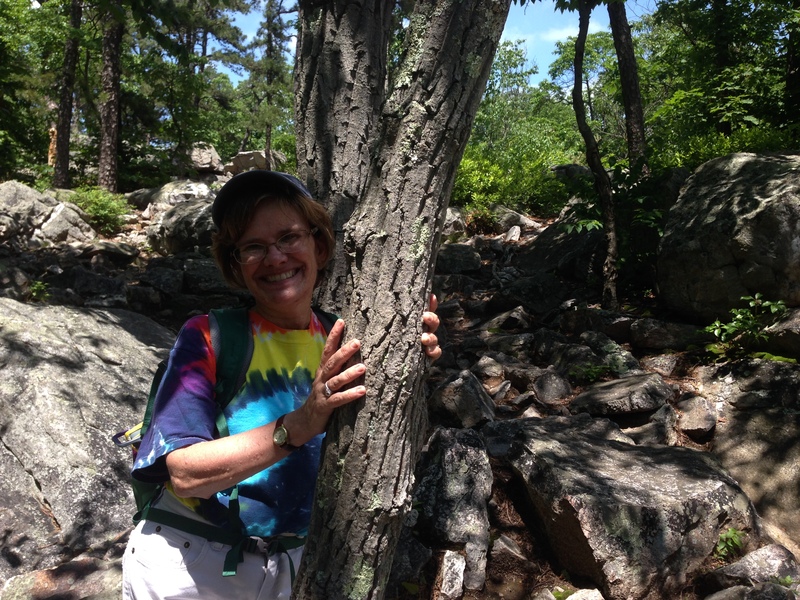 This entry was posted in Maple's Jots on Jaunts and tagged Catoctin Mountain Park, Day Hike, hiking by Maple. Bookmark the permalink. You all look like you are having a great time! The trail from HQ to the visitor center is only a couple of years old, but it is way better than the road. People fly down 77 … Take it from a hiker who had to wiggle her way along the road and creek before the park service built the connector between HQ and visitor center! Just plain stressful & dangerous!! Looking forward to more of your adventures!